Corresponding with the West, the element of Water, and the planet Venus: Rose Quartz is associated with the heart, love, peace, romance, intimacy, and beauty as well as bond strengthening, protection from fears and nightmares, stress reduction, and fertility. Each of these natural Rose Quartz rune stones bears one of the twenty four traditional symbols of the Elder Futhark runic alphabet except for a single stone that has been left blank. Crafted from natural stone these divination crystals may vary in color and are approximately 1/2 inch to 1 inch in diameter. 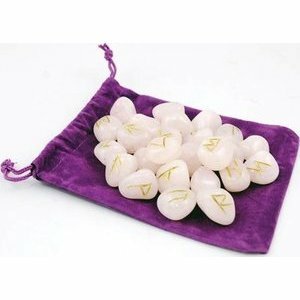 Each rune set contains 25 Rose Quartz crystals.